Courgettes (also known as zucchini, baby marrow, or baby squash) are beautifully tender vegetables with a fresh, delicate flavour. For this recipe you will want to use the small, slightly bulbous, pale green variety often sold as Lebanese courgette, or Mexican grey zucchini in the US. Look for firm, heavy-feeling courgettes with unblemished bright and glossy skins. In this stuffed courgette recipe, the courgettes are stuffed with spiced meat and then cooked flavourful yoghurt. 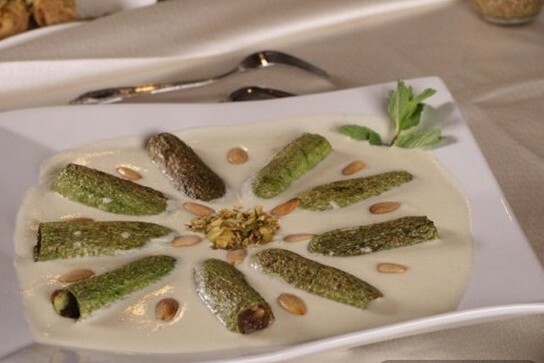 If you like yoghurt stews, you may also enjoy Shakriyeh (Yogurt With Meat). And if you enjoy stuffed courgette, you may like Kousa Mahshi (stuffed zucchini). 1. Prepare the Filling: Brown the meat, add the chopped onions and spices (cinnamon, allspice, nutmeg, black pepper) and salt and cook on medium heat until the meat and onions are done. Allow it to cool down then add the fried or toasted pine nuts (optional). 2. Prepare the courgettes: Hollow the courgettes with a vegetable corer and place in a bowl full of water. Drain well and stuff with the prepared filling (3/4 full). Heat 1 tbsp. of oil in a saucepan and shallow fry the courgettes. In the same saucepan, cover the zucchinis with water and bring to a boil. Lower the heat and simmer until the zucchinis are 3/4 done. 4. Cook the Yoghurt: Dissolve the corn starch in cold water. In a saucepan, combine the yoghurt with the dissolved corn starch. Bring to a boil stirring constantly (do not stop stirring until it boils). Add the yoghurt to the zucchinis, season with salt and simmer (uncovered) until the zucchinis are tender. 5. Re-season the yoghurt sauce with salt and serve with plain or vermicelli rice.